Northwest Georgia will always be tied to carpet, the No. 1 industry of the region. But it isn’t just jobs lost in the carpet industry that must be replaced: The closing of Blue Bird Corporation’s school bus manufacturing facility in Walker County cost 350 people their jobs in 2010. Add 2011’s treacherous weather and the damage it caused, and that makes for an especially hard time. Fortunately, there are successes to report, too. In the new 480-acre Walker County Business Park near Rock Springs, Barclift hopes to attract potential auto parts suppliers for Kia (in West Point) or Volkswagen (in Chattanooga). The county’s 100 percent Free-port Exemption helped draw Findlay’s Tall Timbers Distrib-ution Center last summer. “Our existing industries are adding jobs; manufacturing is slowly but surely coming back,” says Barclift. Dade County purchased 200 acres for industrial use and effected a land swap with the city of Trenton to rebuild the Georgia Forestry Service facility destroyed in the storm. “We’re holding our own,” says Raper. Eaker expects retail to continue to build off the addition of Costco to the community in late 2010. “It’s a big advantage, being right over the Tennessee state line and having lower tax,” she says. Dalton-Whitfield County Joint De-velopment Authority has 184 acres under industrial development at Carbondale Business Park. In February 2011, XL Brands purchased a 16.3-acre site to expand its production and shipping capabilities with a 122,000-square-foot facility. In Gordon County, leaders are looking forward to a new interchange on I-75 that will increase distribution and industrial opportunities. “Gordon and Calhoun have been working with state and federal authorities on a new diamond interchange at Union Grove Road and I-75,” says Jimmy Phillips, president of the Gordon County Chamber of Commerce. “This would allow for the extension of Union Grove and a South Calhoun bypass from east to west to Highway 52. A new interchange would certainly open a new door for industrial activity, right near Mohawk’s large distribution facility, and Shaw’s distribution operations. They and others in the industry anticipate expansions because of the new route that will be created for trucks,” says Phillips. Manufacturing is booming in Rome, which added nearly 1,000 jobs in 2011. “Lowe’s RDC [regional distribution center] announced a $125-million, 1.4-million-square-foot expansion, creating 600 jobs – we’re very, very proud of that,” says Al Hodge, president and CEO of Greater Rome Chamber of Commerce. “Kellogg also made a $25.5-million investment and created 25 jobs. Brugg Cables, LLC, spent $5 million and expanded by 10,000 square feet; Neaton Rome invested $26 million, to expand by 72,000 square feet and create 113 jobs,” says Hodge. In total, Rome saw $181.5 million in investment with 958 jobs created, he says. There is also the recently opened Cave Spring Rehabilitation Center, a $10-million facility to serve the hearing-impaired, and South Rome’s Etowah Village, a 77-unit senior apartment complex that cost $10.5 million and features trails to downtown Rome, generating real estate interest. Down the road, the Northwest Georgia Clinical Campus of the Medical College of Georgia at Georgia Health Sciences University will locate at the Georgia Highlands College campus. “It will provide training for third- and fourth-year students of professional medical education, co-locating on a campus in Rome with Georgia High-land College,” says Hodge. The city is excited about the project, which will open its doors in 2013. “It has created a culture of cultivation in the community,” says Hodge. In Polk County, Meggitt Polymers & Composites, winner of a 2011 Georgia Large Manufacturer Of the Year award, announced it will hire 90 employees. Canam Yarns (Canadian American Yarns) announced it will invest $4.5 million in manufacturing expansion, creating 10 jobs. 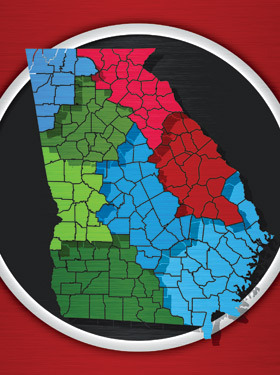 “The manufacturing sector may be very guarded with their growth, but they have their eye on the ball and think northwest Georgia is a good place,” says Eric McDonald, president of the Polk County Chamber of Commerce and Development Authority. The county benefited from its Camera Ready designation when production of Jayne Mansfield’s Car brought Billy Bob Thornton, Kevin Bacon and Robert Duvall to town last fall. “When it opens this spring, you’ll be able to see Cedartown in all its glory,” says McDonald. “We’re also finishing up $1 million in streetscaping, and we’ve hired The Fanning Institute to work on a strategic plan. We’re also building a new access road to Cedartown Industrial Park, where we may put a 105,000-square-foot speculative building,” says McDonald. In Haralson County, two automotive manufacturers and a leading manufacturer of tamper-evident security seals added jobs over the past year. “That contributed to our manufacturing growth and the decrease in our unemployment rate [9.2 percent in January],” says Tara Chapman, executive director of the Har-alson County Development Authority. Last year Bartow County, in partnership with Toyo Tire, was authorized to increase its bond capacity to $910 million to expand Toyo’s headquarters and create 470 new jobs, winning a Georgia Economic Development Authority “Deal of the Year” award. “We’ve had a steady economic recovery in Bartow in 2011,” says Melinda Lemmon, executive director of the Cartersville-Bartow County Department of Economic Development. And Bartow is just revving up: Future “game changers” include the arrival of LakePoint Sporting Community & Town Center and the community’s Georgia Ready for Accelerated Development (GRAD)-certified Highland 75 corporate/industrial park. And don’t forget the Camera Ready status: This summer, viewers will see Cartersville locations in The Three Stooges movie.